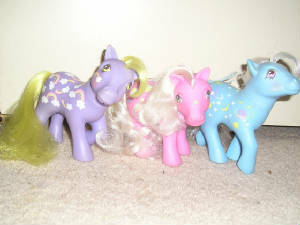 These are some of hasbro's earlier my little ponies. 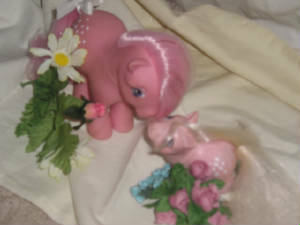 The pink pony's name is cotton candy and the lavender pony's name is blossom. There are six ponies in this collection they are cotton candy,blossom, Minty, Snuzzle,Butterscotch and Bluebelle. 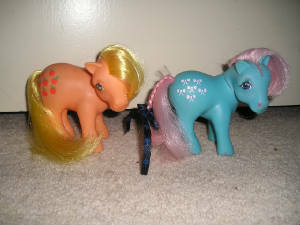 here is the next set of ponies. 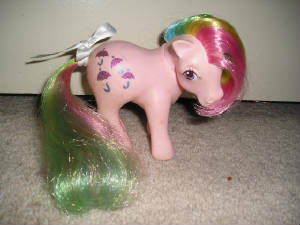 these rainbow ponies come in earth ponies, unicorn ponies and pegasus. Here are some of the twice as fancy ponies from left to right,Merri whether, Bonny bonets ad night glider. 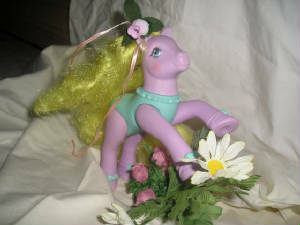 this mlp is a ballarina pony with moveable legs. Her name is tip toes. I think hasbro has a great idea, making mummy and baby mlps. There is also mummy and baby Blossom and mummmy and baby Suprise. Look out for loving family ponies they include:A Mummy, Daddy,Baby Brother and Baby sister. I don't have any loving family ponies,But I'm sure they are pictured in other mlp sites.